Offering you a complete choice of products which include pallet hinge, pallet collar hinge and euro pallets. 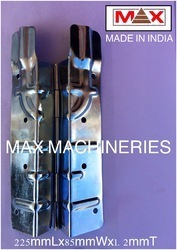 Valued as first among the best, we present clients with the superior quality of Pallet Hinge. Made from mild steel, the pallet hinge is available with us in thickness of 1.2mm, 1.3mm and 1.5 mm. In order to ensure corrosion resistance finish, the pallet hinge is coated with galvanized coating, power coating or zinc coating, in accord with the demands of our customers. Pallet Collar Hinge are designed specially to connect the four panel corners of the wooden Pallet collars, which are stacked on pallet to make a container. 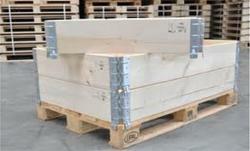 In this way the goods in the pallet can be protected very well. Wood collar systems are available in custom-made sizes. not only reuse able, recyclable and cost effective, they include fast easy set up, collapsible hinge design and are easy stackable.